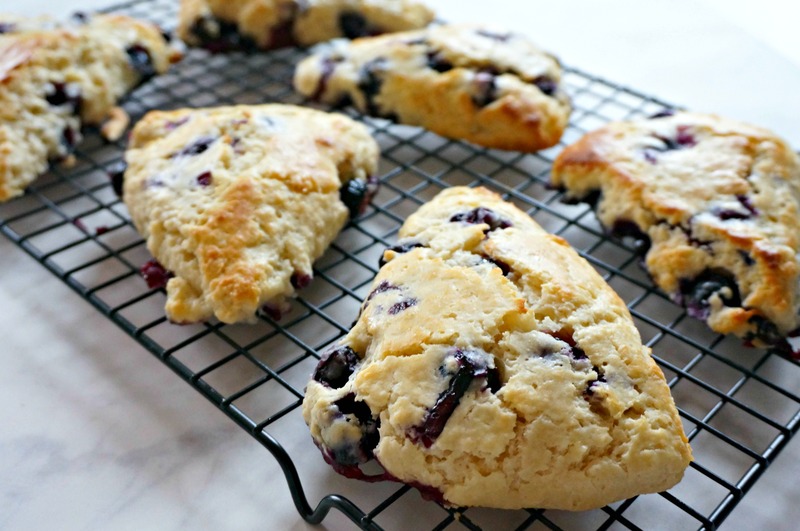 Be sure to add the blueberry scones recipe to your breakfast board on pinterest! I DID IT! To borrow a common phrase from my favorite two year old, I am so happy to announce that I FINALLY did it. Welcome to my new blog… Forks and Folly. What happened to Mom Favorites? I got burned out. 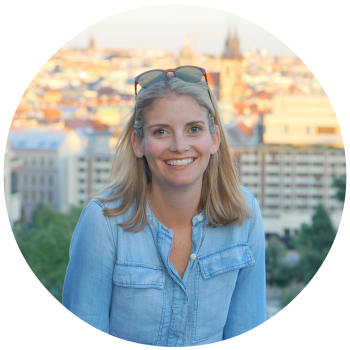 I realized that although I love being a mom, I’m tired of blogging about being a mom. 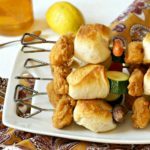 And, I discovered that my favorite thing to write about, and your favorite thing to read about on my blog were my recipes. Which brings us to here… Forks and Folly! I hope you love the new site as much as I do. 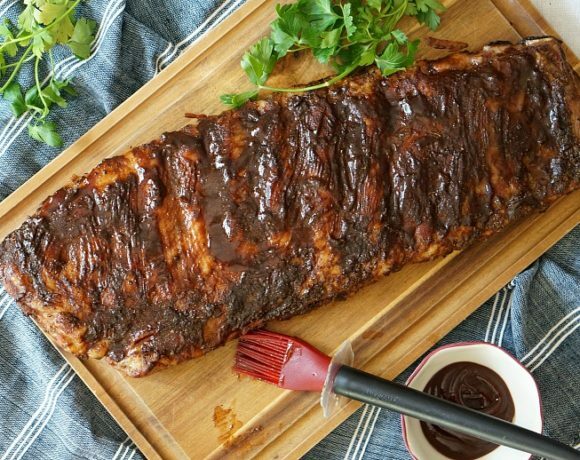 You’ll still find most of our old content, and moving forward we’ll be doing more of what we both love – great recipes, fun meal plans, and tips on getting the whole family involved in the kitchen. Admittedly, I lost my way. Happens to the best of us. 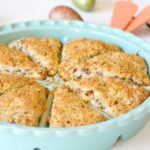 But, it’s a brand new day, a brand new blog, and I’ve got a brand new recipe to share with y’all! And, if you’ll do me the honors and put a little faith in me… consider subscribing to the blog again. You can do so here. 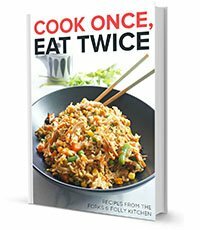 In exchange, I’ll send ya some of my favorite “Cook Once, Eat Twice” recipes. As always, thanks for reading… thanks for sharing… there may be a few things under construction over the next few weeks, but hang tight. We’ll be up to full speed soon! 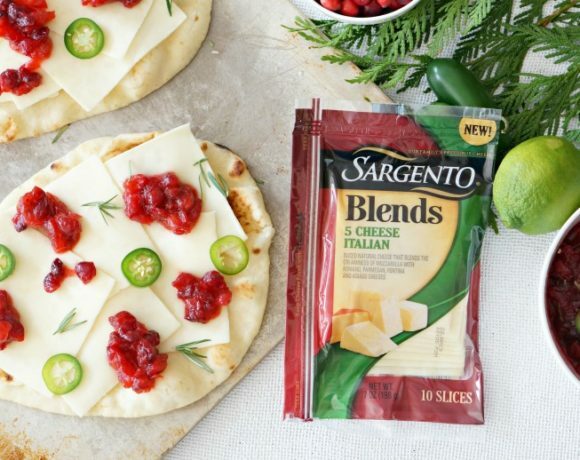 Now, let’s get cooking…. 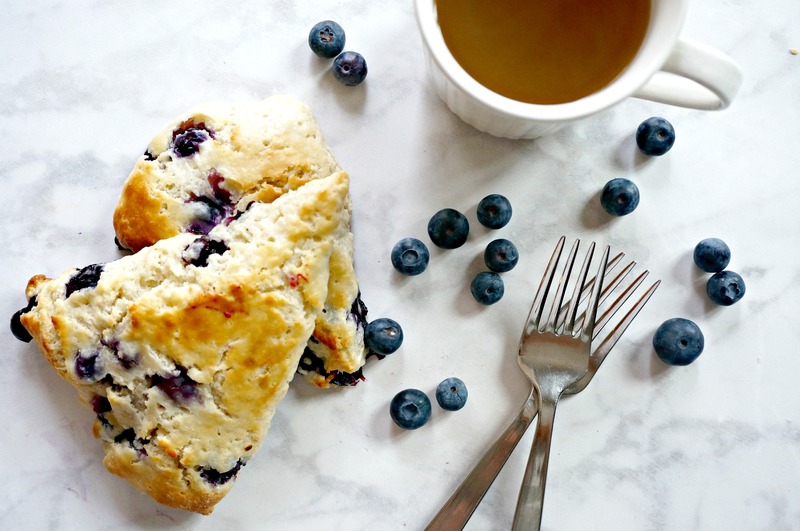 this Blueberry Scones recipe, is golden on the outside and buttery on the inside! And smells so good when baking! Wanna know the secret to making these? Freezing the butter in advance, then grating it on a box grater. Makes incorporating the butter into the batter so easy! And I love adding some pure vanilla extract. Yum. 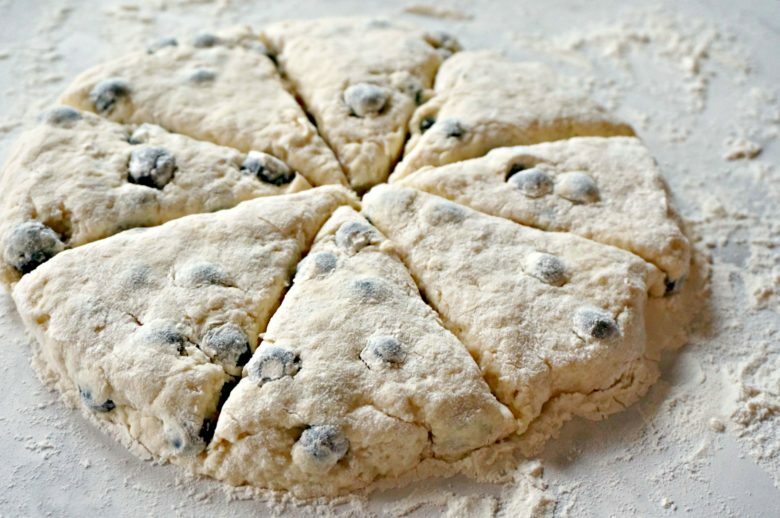 After the dough comes together, gently fold in the fresh blueberries. And place on floured surface. Form it into a disc and cut into triangles. 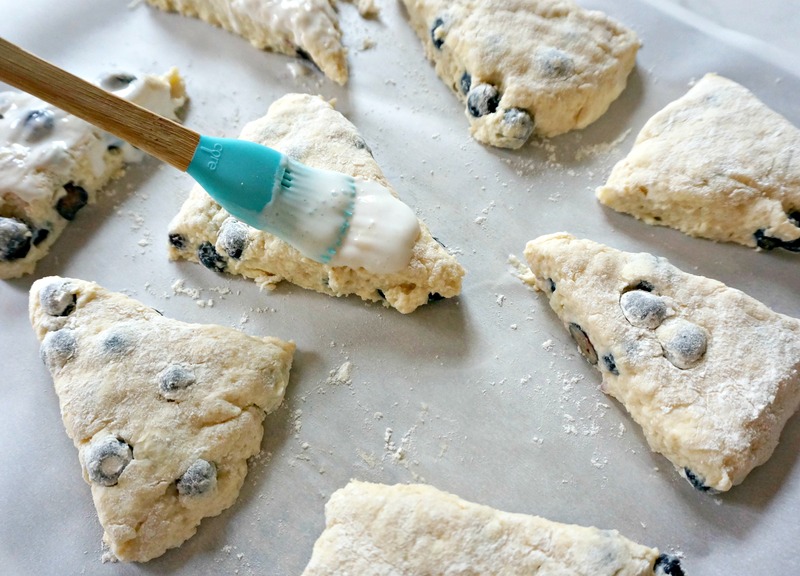 Place the triangles on a baking sheet with parchment and brush with buttermilk. Seriously. It really does help make them golden. Buttery on the inside, golden on the outside, these delicious blueberry scones are also really easy to make! In a medium bowl, mix buttermilk, sour cream and vanilla. Place in refrigerator. 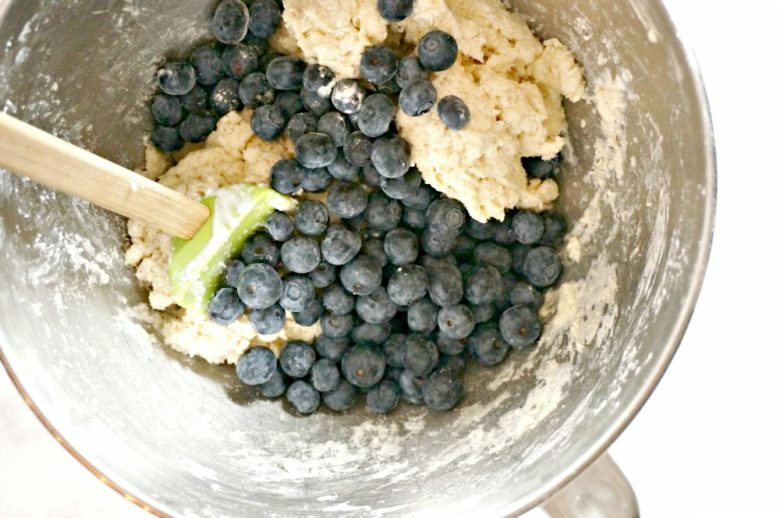 In another medium bowl, mix together flour, sugar, baking powder, and salt. Using a fork, stir in the frozen grated butter. Drizzle in the sour cream mixture until almost fully incorporated. Gently fold in the fresh blueberries. Try not to burst too many, but don't sweat it if you do. Dust work surface with flour and work dough into a large disc. Cut into 8 slices (kinda like a pizza), then place a few inches apart on the baking dish. Brush with buttermilk then bake 17-20 minutes or until golden . Remove, cool on wire rack then enjoy! What’s Hap-pinning, vol.4 – Fun with Chiquita Bananas! Minor detail! 😉 Thanks for letting me know. 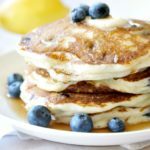 The recipe has been updated, and I like to use 1 cup of fresh blueberries. Made these scones, they were amazing !Everyone loved them !